Expunge the IFs and the WHENs – Be Happy! The idea that you can worry today and someday in the future you will be happy is the one that induces all your suffering! We have been conditioned to believe that happiness comes from all our external reference points and is subject to certain conditions being fulfilled. I will be happy IF I get a job. I will be happy IF I get money. I will be happy WHEN I get a good companion. I will be happy WHEN I get to sell my property. The IFs and WHENs in our Life are the ones that cause us unhappiness. The very logic that we will be happy upon reaching a milestone means that if we don’t reach it, we will be unhappy. And the human mind is such a creation that when one want is met, one milestone is attained, it will want more, and want to conquer another milestone. So, there is a perpetual chase that we are on, and therefore, that’s precisely why we remain perpetually unhappy. As individuals, as families, as communities, as nations, as a world and as a race! Bhutan, the tiny Himalayan kingdom, has made significant moves to change this thinking at a national level. It introduced, a couple of years ago, a measure called Gross National Happiness (GNH), in lieu of GDP, which focuses on what it believes are four contributors to a nation’s happiness levels: sustainable economic development, conservation of the environment, preservation of culture and good governance. But these four aspects prima facie may mislead. In reality, Bhutan’s GNH survey asks people simple questions like ‘How many people can you count on for help in case you get sick? How often do you talk about spirituality to your kids? When did you last spend time socializing with your neighbors?’. These are questions that apply to you and me too. And it’s high time we ask them and several more. What Life will teach you, if it hasn’t taught you already, is that by choosing to save ‘being happy’ for another day, you are actually postponing living. Important too is the fact that you need nothing to be happy. You just must be willing to be happy. 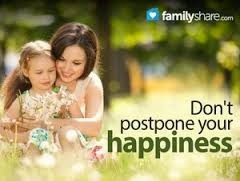 Happiness is not dependent on any circumstance. Nothing can really make you unhappy UNLESS you allow it to! So, please don’t put off being happy for another day. Because, you never know, tomorrow may never come! Author AVIS ViswanathanPosted on September 17, 2014 March 14, 2016 Categories Art of Living, Being Happy, Bhutan, Gross National Happiness, Happiness, Ifs and Whens, Inner Peace, Intelligent LivingLeave a comment on Expunge the IFs and the WHENs – Be Happy!